Silicone rubber coated fiberglass tape is used to protect critical hydraulic hoses, lines, wiring and cables from heat, flame, welding splatter ,grinding sparks, contamination, ozone, UV and abrasion. Fabricated from a knitted heavy-duty fiberglass tape plus the added protection of a thick layer of high-temperature silicone rubber. This tape provides thermal and electrical insulation, energy savings and personnel protection. InSilMax tapes are made from fibers that can be used to Generally, Silica high-temperature products can be used to 1800°F / 982°C continuously, and 1900°F / 1037°C for extended periods without degradation. It melts above 3000°F / 1648°C. Also available as a slit tape from fabric roll, and as a folded and stitched tape, and a woven tape. This tape provides thermal and electrical insulation, energy savings and personnel protection. Weld splatter can easily damage electric welding cables, cooling water hoses, gas hoses, and also contaminate robotic welding elbow joints. There are various fabrics, tapes and sleeves that can be used to cover and protect equipment assets. Most silicone rubber coated fabrics, tapes and sleeves can be used, as the splatter doesn't stick to the silicone rubber when it strikes the protection material. Any splatter that does remain sitting on horizontal surfaces does little damage to the silicone, as the silicone has the property of high thermal dispersion - hot spots are quickly dispersed. Many of the sleeve and fabric products have a very thick layer of silicone rubber for extra protection. Other materials such as neoprene coated fiberglass provide good burn-through protection when used as a vertical hanging curtain. Other fiberglass materials with various coatings such as pvc can also be used when used as a vertical hanging curtain. Uncoated materials such as InSilMax fabrics, tapes and sleeves can also be used as the weld splatter does not easily burn or melt its way through the fibers; in fact the InSilMax fabrics can hold molten metal without burn-through, making them ideal on horizontal surfaces. For heavy duty protection, materials can be multi-layered to enhance burn-through protection. Silicone rubber tubing is available in 21 standard sizes and is usually always in stock. Tubing can be slit, and then used as a wrap to cover wiring, cables, hoses, using a tie wrap or stainless tie wrap to hold the tubing in place. Fiberglass (fibreglass or glass-fibre) tape coated on two sides with high temperature silicone rubber. This tape is fabricated from a woven fiberglass substrate, and in available in widths up to 40" wide and lengths up to 150 feet continuous. Silicone rubber coated fiberglass sleeve can be used to cover wires, cables and hoses to protect against weld splatter. The base fiberglass layer provides excellent thermal insulation value and added protection . 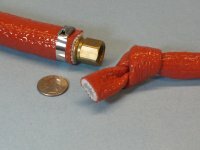 Sleeve can be slit, and then used as a wrap to cover wiring, cables, hoses, using a tie wrap or stainless tie wrap to hold the tubing in place. This sleeve uses a velcro hook and loop closure to allow retrofit of the sleeve to wires, cables and hoses without disconnecting them. Also allows easy inspection and serrvice of wires cables and hoses. A heavy duty version of this tape ia available, which is slit from our 98oz heavy duty onse side coated fabric. Due to its high thermal dispersion index, silicone rubber sheet makes a good barrier for welding splatter: can be draped over equipment and machinery, or cut into strips and shapes to protect complex shapes. · Due to its high thermal dispersion index, silicone rubber coated fiberglass fabric makes an excellent barrier for welding splatter: can be draped over equipment and machinery, or cut into strips and shapes to protect complex shapes. Can also be fabricated into curtains. · Neoprene Rubber coated fabric makes an excellent weld splatter protection fabric, and at a lower cost than silicone rubber coated. · Uncoated InSilMax fabric can be used to contain weld splatter on horizontal surfaces due to its excellent burn-thru protection.. Custom made curtains made to order; any size. Welding blankets for draping over machinery or equipment can also be fabricated to any shape or dimension.